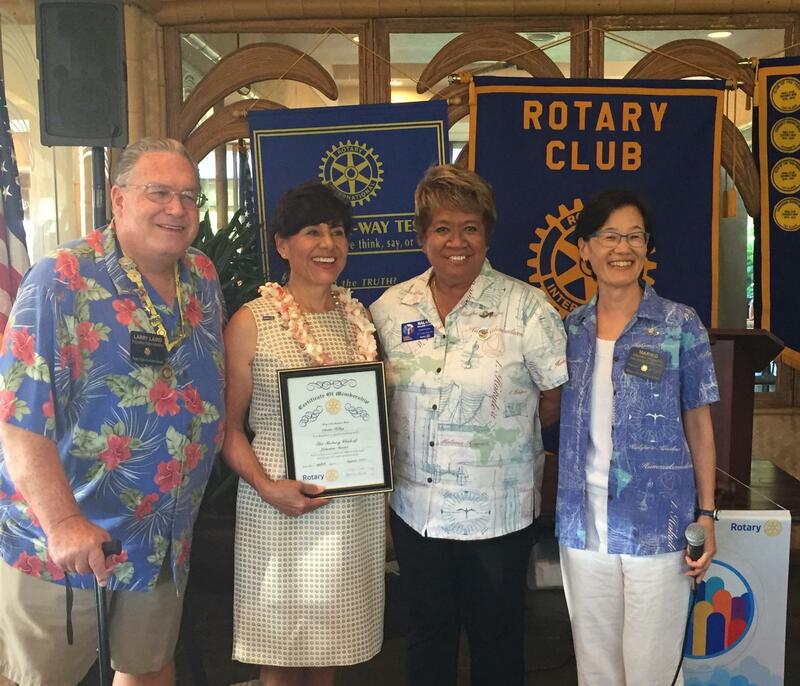 Olinda Kelley was inducted into the Rotary Club of Lahaina Sunset by District Governor Nalani Flinn on August 8th. Olinda a native California, has enjoyed Maui living since the mid-1970ʻs. A flight attendant job transfer to Honolulu in 1976 allowed her to commute to Oahu from Lahaina for 35 years. She had the dream job of traveling the world while enjoying a simple, island home life. Lucky to live on Maui, she was also lucky to have met a special passenger - her future husband of 31 years, Michael Kelley. Together they have built and currently operate a variety of hospitality companies on three islands. Teralani Sailing Adventures, Aqualani Beach and Ocean Recreation, The Spa at Black Rock, and 5 Star Scuba are just a few of their enterprises. Their two grown daughters, Tera Lani and Kianna, are busy young women working on the mainland. Olinda is excited about joining the Lahaina Sunset club. She is looking forward to becoming connected with active west siders who are making a difference in our dynamic community. Olinda’s sponsor is Larry Laird.